Cheesecake is one of those desserts that everyone enjoys, right? And when you make it on the counter without using the oven is even more awesome. Yep, that's right... While other things are cooking, you can whip this cheesecake up and I promise everyone will love it. - Place the biscuits and cinnamon in a mixing bowl. Melt the butter and honey together, pour over the biscuits, mix until everything is coated and place it in a foil-lined cake tin. Pat and even it well. - Mix the cream cheese, sugar, lemon zest and juice together and set aside. - Cover the the gelatin with the 8tbs cold water, let it sit for 10min, then warm up to liquidise and set aside. 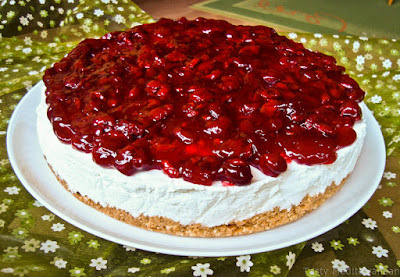 - Whip the double cream until stiff peaks, add the gelatin and fold in the cream cheese mixture. - Spoon it over the biscuit layer and place in the fridge for 5h to set. - After it's set, carefully place it on serving plate. - In a small bowl mix the custard powder with 5tbs water spooned out from the 300ml water. Stir until well mixed. Put the rest of the water in a pot, add sugar and bring it to a boil. Add the berries together with their juice and stir. Slowly start adding the custard mix and stir for about a minute until the mix starts to get thick. Let it cool completely, then spoon and spread it over the cake. Enjoy!